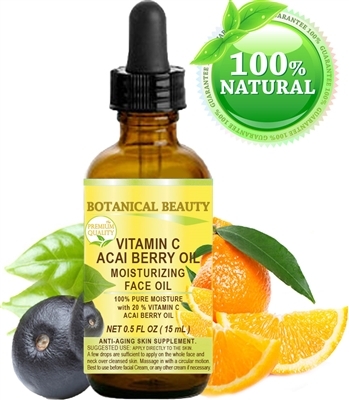 Botanical Beauty VITAMIN C Anti-aging, moisturizing, regenerating and nourishing. with 20% Vitamin C. Botanical Beauty VITAMIN C is the skin hydration booster and pure moisturizer. VITAMIN C MOISTURIZING FACE OIL ORGANIC 0.5 Fl.oz - 15 ml. VITAMIN C STRAWBERRY Face OIL 0.5 Fl. oz - 15 ml. VITAMIN C MARACUJA Face OIL 0.5 Fl. oz - 15 ml. VITAMIN C BLUEBERRY Face OIL 0.5 Fl. oz - 15 ml. VITAMIN C ROSEHIP Face OIL 0.5 Fl. oz - 15 ml. VITAMIN C STRAWBERRY Face OIL 1 Fl. oz - 30 ml. VITAMIN C MARACUJA Face OIL 1 Fl. oz - 30 ml. VITAMIN C BLUEBERRY Face OIL 1 Fl. oz - 30 ml. VITAMIN C ROSEHIP Face OIL 1 Fl. oz - 30 ml. 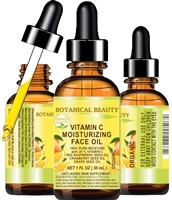 VITAMIN C MOISTURIZING FACE OIL ORGANIC 1 Fl.oz - 30 ml.